As responders from around the nation move into the ravaged areas of Texas damaged by high winds and extreme flooding from Hurricane Harvey, one federal flood insurance program has started to sink even further into debt. NFIP or the National Flood Insurance Program, which is the only source for most people in the U.S. for flood insurance, is already in debt of $23 billion after servicing other natural disasters that included Hurricanes Katrine and Sandy. The costs created from Harvey will increase NFIP’s debt by the billions of dollars. The program, which FEMA oversees, has borrowed from the United States Treasury and in essence taxpayers, to keep operating. That debt becomes due in September, when the program will come up in Congress for reauthorization. The government already has said it would be next to impossible for the program to repay the staggering amount that is due, which has caused some to say the program has to been completely overhauled to prevent any debt accumulations each time a disaster occurs. The nation’s Government Accountability Office included this program on the High Risk list since 2006 as it has found flaws with the fundamental structure of the program. A recent report released by the GAO said that the lack of enough revenue by the NFIP highlights the structural weaknesses in the way the program is funded. 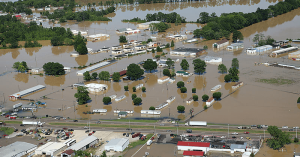 The report added that since the program has rates which do not completely reflect the risk for flooding, NFIP’s structure for rate-setting was not designed actuarially sound nor intended to generate enough funds to cover its complete losses. However, the gravity and urgency of situations in both Louisiana and Texas could put pressure on Capitol Hill lawmakers to pushing through a rapid reauthorization prior to the program’s expiration on September 30. Other hope lawmakers might pass a reauthorization on a temporary basis while working on reforms of a longer term, including the possible updating of zoning maps as well as the expansion of coverage options to the private insurance companies. It has been estimated by FEMA that damage from only an inch of water is more than $20,000. In Texas’ coastal areas, rainfall reached more than 50 inches prior to the storm completely leaving the region. Over 50% of the commercial and residential properties in Houston are no in the FEMA Special Flood Hazard Areas and only those with properties within the flood hazard areas must purchase flood insurance.